A list of leaked part numbers for Apple’s purported ‘iPad Mini’ published by Apple Insider reveals that the rumored 7.85″ iPad will come in four different storage capacities and two color options with 24 different models in total, when Apple unveils it at the October 23rd media event. 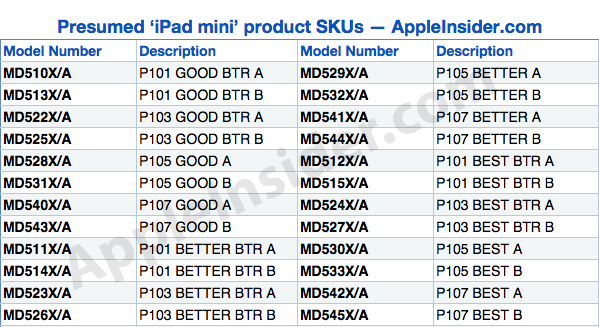 The list of presumed ‘iPad Mini’ stock-keeping units (SKUs) shows four basic device variants, corresponding to different capacities: P101, P103, P105, and P107. Each set further suggests that Apple may release the smaller iPad with capacities ranging from 8 GB up to 64 GB. “The lineup could suggest that Apple plans to introduce an 8-gigabyte model that would serve as an entry-level model for the lower-priced 7.85-inch iPad. 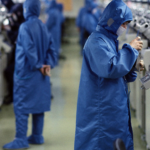 Currently, the full-sized iPad does not come with a storage capacity lower than 16 gigabytes. Each of the four different product descriptions also come with three different distinctions: “GOOD,” “BETTER,” and “BEST,” which could signify Wi-Fi-only, 3G, and 4G LTE models, respectively. Each model is also available in “A” and “B” variants, which likely identify color options of black and white”. The report also claims that initial shipments suggest availability of the entry-level “P101” 8 GB model will be the greatest at launch, which could cost around $249. I guess we’ll find out the rest next week won’t we?